The Moon Goddess costume is finished and had it’s first on stage outing! I’ve been busy with teaching the last class before the Summer holiday, the student recital of my own students (who did an awesome job) and the student recital of my dance friend roos Belinfante. So much to do, so little time! You might have seen the Moon Goddess skirt in passing when I posted about circle skirts. I used close-ups of the side seams for my post about finishing straight seams. And I ended up edging the hem with fishing wire, so it’s very swooshy. But I didn’t post a picture of the finished skirt yet, so here you go. Because blunt pins might cause a thread to be pulled, creating pulls in your skirt. And that would be a shame after all the hard work you’re putting in. The skirt took up a couple of hours but I always wanted a white circle skirt. It’s so dreamy, I can imagine so many different combinations I could make with my dance wardrobe. I think I left off with the sketch in my post outlining the project. After the black and multi-color costume I still had some felt left over and I used it to create the belt base. I made the belt base into two pieces and I choose to add a bit of extra length on both pieces. During pregnancy it is considered normal and a woman is expected to gain 24-36 pounds. Since I am halfway there, being slightly over four months, I am already seeing the changes in my body. Making this costume bigger seemed like a smart plan, as I have performances planned up until half September when I’m seven months along. The belt base was covered by scraps of chiffon. I first pinned the folds down, then stitched it into place with small stitches. I am not completley satisfied with the effect but it’s not bad for the first time of me trying this technique. Wedding dress makers have to practice a long time to get ruching and pleating down to an art (and it shows). I like to look at weddingdresses for inspiration on pleating and ruching as it is very inspiring to see the beautiful things the weddingdress industry makes. 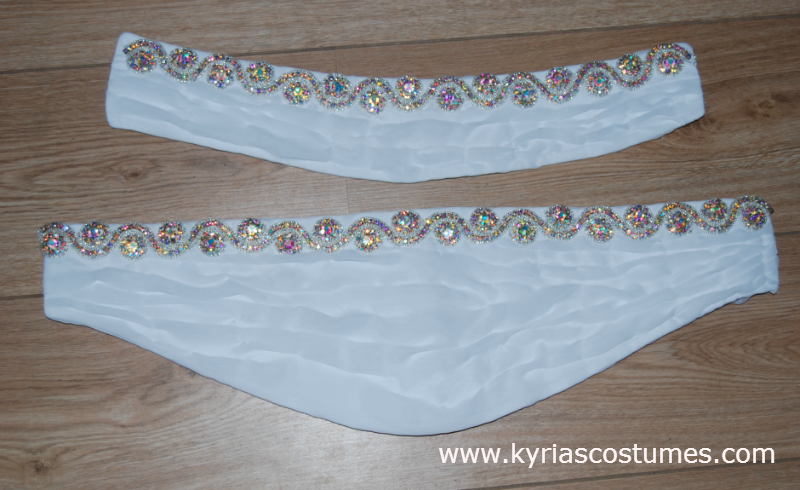 This is the first time that I used pre-beaded rhinestone trim and I am positive about the experience. Easy to cut and stitch to the fabric, though I spend some extra time on finishing the edges of the trim. To make sure that the belt would fit, I pinned the two parts together and try it on. It fit! WIth a bit of extra overlap to spare, phew. 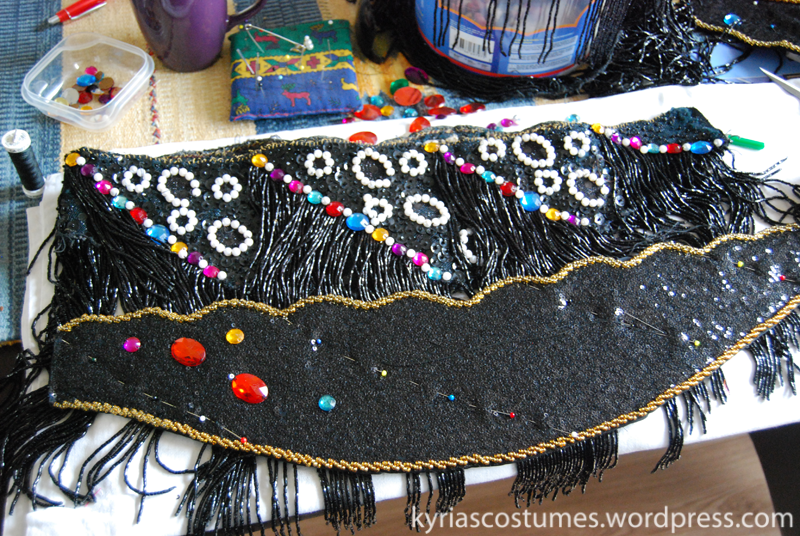 I took out the prebeaded fringe and cut a couple of larger pieces for the lower part of the belt (8 cm wide/ 3″wide). There was some loss of strands but since it was such great quality, it held up well. I then continued cutting smaller pieces to add as accents inbetween the bigger pieces. I ended up with this arrangement. 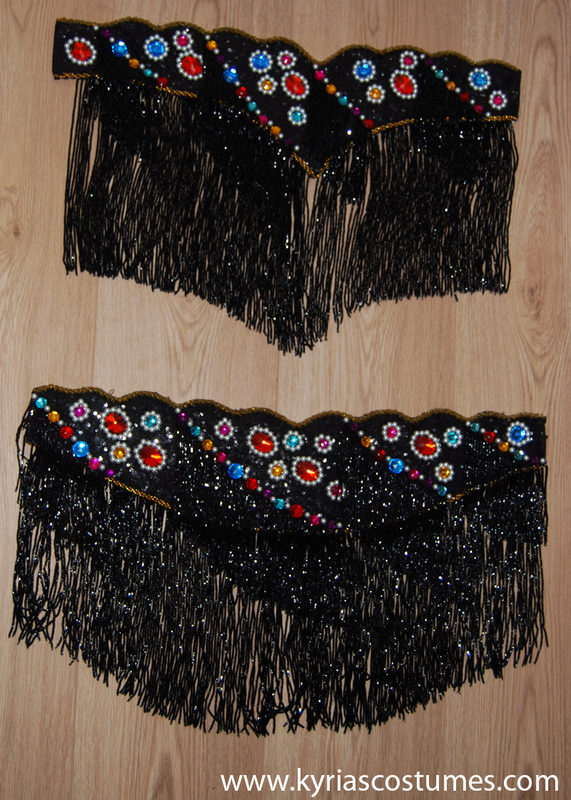 I am a bellydancer and costume-a-holic living in the Netherlands. I enjoy blogging and I have big plans for the future with regards to writing and publishing books and such. I am currently four and a half months pregnant with my first child, which is very exciting. I plan on dancing through most of my pregnancy, we’ll see how that works out. If you enjoyed this post and like to kept in the loop, please like Kyria Bellydance on Facebook or follow me on Twitter. Leave your questions or comments in the box below, or let me know through Facebook and I might write a blog post to answer your costuming question. Yup, I finished the black multi color costume and I decided to continue with stash busting. I always wanted to make a goddess type costume with flowing white chiffon and a lot of AB crystals. Through the years, I made several drawings and sketches, playing around with the design. This is my most recent sketch, I drew it by hand and did a bit of coloring with photoshop. The bra ad belt will be covered with chiffon that has been pleated and sewn into place. The beaded trim is accenting the upper edge of the belt and lower edge of the bra. Some draped fabric hanging off the shoulder creates an interesting line and some movement from the shoulder strap. The general idea is Golden Era meets goddess. 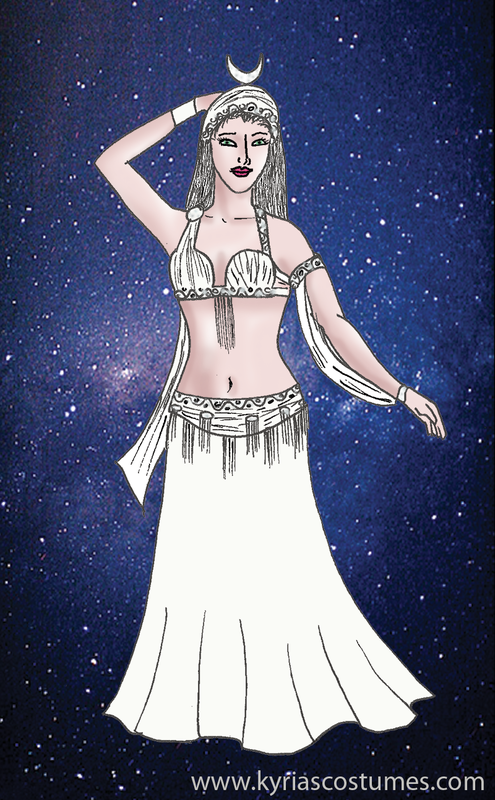 Since I am preparing a performance where I am symbolizing the moon, I’ll call this one the Moon Goddess costume. The good news is that I have most of the materials already in my stash, probably because I collect fabric and beads like a squirrel collects nuts. What do you think, should I use one type of fringe? two types? three types? and if I have to choose, which one would work best? I have a yard of each. Leave a comment below or on my facebook post. I get a lot of questions about where I buy my beaded fringe because it is hard to determine the quality of the fringe from a picture on a screen. In this post I gathered a couple of reliable vendors and websites that sell beaded fringe. Pepper Alexandria on Facebook. Several of my friends bought fringe from her and they like the quality and service. Horus and isis – Excellent quality beaded fringe. They have a minimum order of 150 usd but they are the genuine deal. Just look at that fringe.I have two pieces of fire fringe from Horus and Isis in my stash that I have big plans for. They also carry swagged fringe and various color combinations. Turquoise International -Carries superb quality fringe with, unfortunatly, very high prices. I like browsing through their catalogue for inspiration. Scheherezade Imports – They sell beaded fringe, and show on their website what’s in stock. Since I am on the European side of the ocean, I’ve noticed that it is often cheaper and faster to buy directly from Egypt. Be careful through, the quality might vary. In my experience, the fringe I got through eBay is lower quality compared to the more expensive fringe I got from Sakkara.de. Sakkara seams to no longer carry costuming supplies. Tabou.de – Limited colors, but good quality and they are fast with shipping within the EU. The belt is in this case the most intensive part of the costume project. Due to the size and the amount of decoration, hours needed to compete this part of the project will probably be over 15 hours. Not time to waste, so let’s get started! 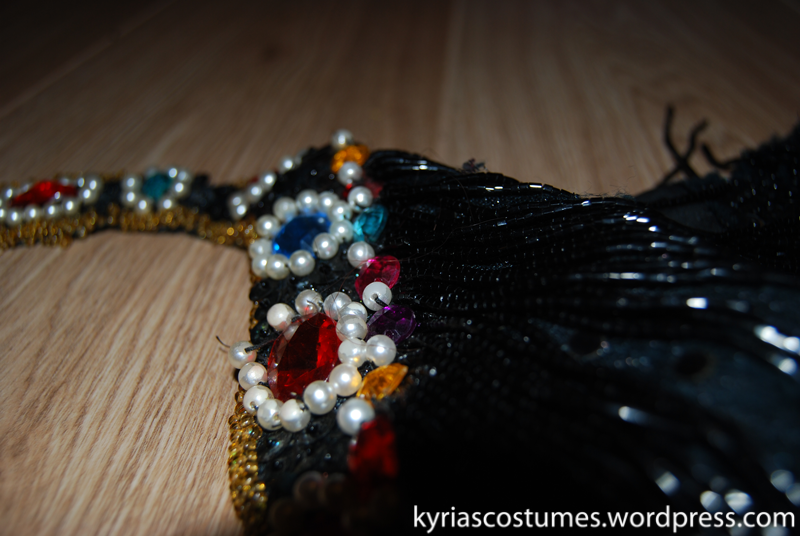 The previous belt was unlined, worn down and had damage to the pearls, acrylic jewels and the beaded fringe. Since there was so much damage to the original material, I needed to replace some of the materials and remake the costume. In this blogpost I wrote about the belt base so I am not starting from scratch 🙂 I started with rope beading the edges in gold seed beads. The original nelt didn’t have beading on the lower edge, but I quite like to see the shape of the belt and the rope beading brings a bit of attention to taht area of the costume. To make sure that the fringe was transfered to the right place, I put the base next to the vintage belt and marked the fringe placement with pins. After marking I removed the original acrylic jewels and placed them on the new belt. Here;s a shot to give you an idea of what my workspace looks like. It is kind of chaotic because I like to have everything within an arms reach. The folded white tablecloth underneath the project is added so I could take pictures with a neat background during the proces. The belt however, is too big to be photographed against the white cloth so I resorted to taking pictures by laying it down on the floor. I can recommend working on a space with a background that contrasts with your costume to help you focus and concentrate on the project. Also, eye fatigue is a real thing and a good background that calms the eyes is helping to stay fresh. I did both front and back of the belt in this manner. On the new belt I added more stones because I wanted more bling. 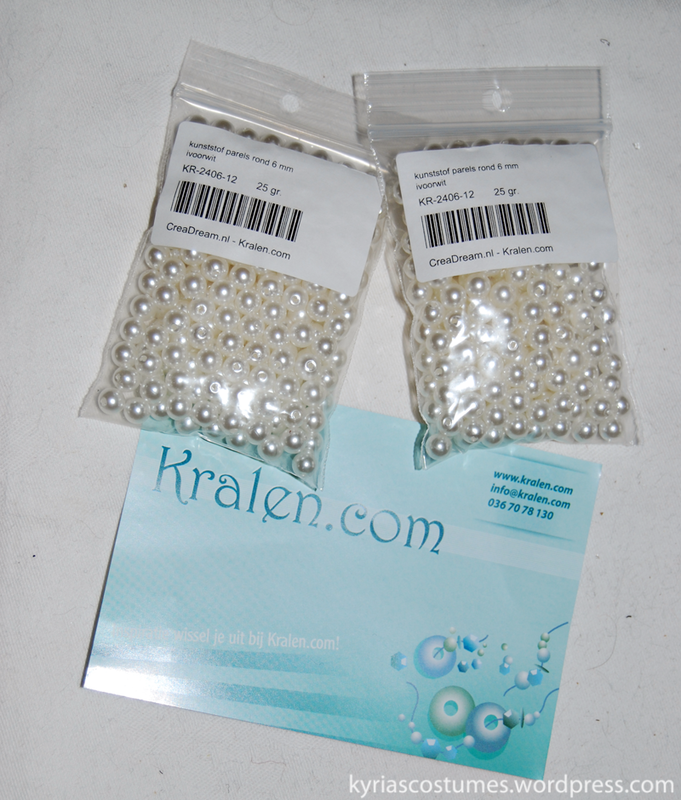 At this point I was waiting for the mailman for the plastic 6mm pearls I ordered online a couple of nights ago. While I was finishing up the belts, my husband came in with the mail and it included the pearls. Huzzah! I ordered from the Dutch website ‘Kralen.com’ and I recommend them, speady delivery and nice pricing. I ordered two packages of 250 pearls each and I was wondering if this would be enough. They didn’t have more of this type in the webshop so I decided to use this frst before ordering more. With the pearls, I edged the jewels one by one. The hardest part was to even out the pearls to create a neat frame for the jewel. I succeeded at most places and have a bit of an issue with a couple jewels where the pearls are not cooperating. You can see what I mean in the picture below. 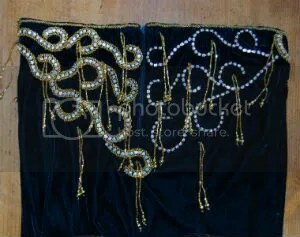 After edging all the jewels I started harvesting the beaded fringe from the vintage belt and pinning it to the new belt. 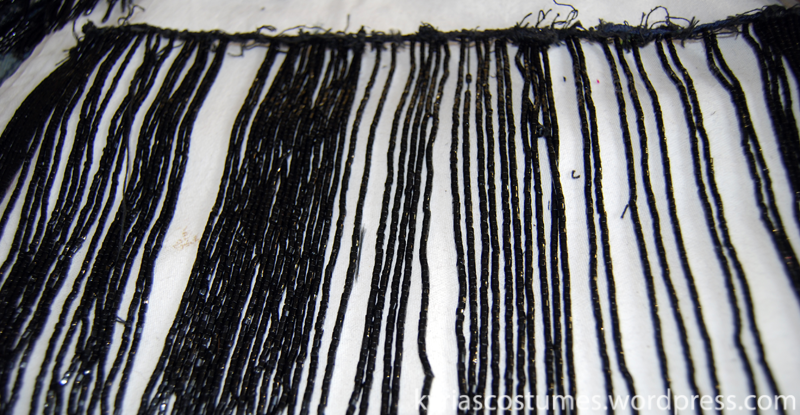 This type of fringe is made in Egypt and consists of beaded frigne ties to a cord. the cord is easy to sew down, cut or rearrange on costumes. Working with this type of fringes is a huge advantage over handbeaded fringe, as handbeading fringe takes a lot of time. The fringe is not cheap (about 25 euro or 30 usd for a meter/yard) but totally worth it. Stitch the fringe to the costume by hand by going through the cord with needle and thread. Make sure to securely attatch the ends of the cord to the belt, as the fringe on the end might fall of when the cord starts to unravel. With a couple of extra stitches this is easily prevented. The good news was that all the short fringe from the belt as in excellent shape. The bad news was that the long fringe sewn to the bottom of the belt was in terrible condition in the back. I didn’t see it in it’s complete glory until I started to remove it from the vintage belt. The damage includes strands that have vanished, remnants of threads, half tied of strands and a bit of a jagged look where the fringe has thinned out. I had to double the fringe in a couple of places to create a fuller, healthy look. I came up short on the long fringes and decided to remove some of the fringe from the bra and put it on th ebelt instead. 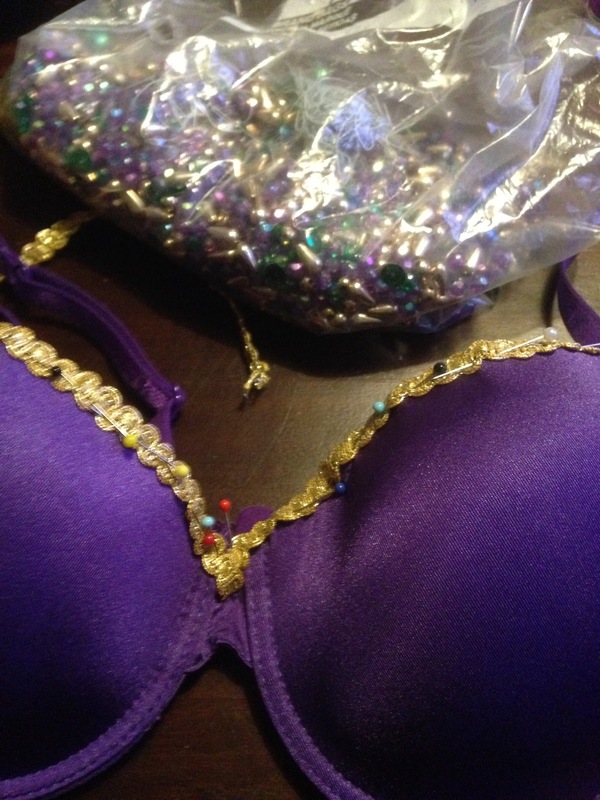 Yes, the bra that I completely beaded and lined a couple of weeks ago. Needless to say I wasn’t to happy about the prospect of demolishing my own work but it had to be done. With the extra fringe from the bra, I completed the belt. I’ll deal with the fringe shortage on the bra some other day. 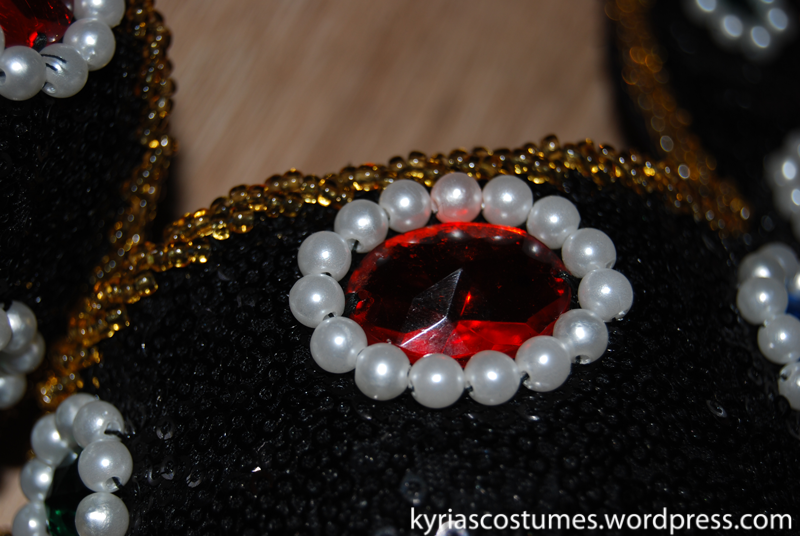 The belt turned out well, the black sequined base really helps to make the pearls and colored gems pop out. Though there are no rules set in stone when it comes to costuming, I strongly believe that using good quality materials and supplies for your costume is the best decision you can make. I can’t make a long lasting high quality costume with low quality materials. What happens to costumes when they are made with low quality materials? The paint from the beads will soon start to flake, the glass beads will break, crystals get scratched and loose their shine, fabric will fray, tear or start to pill and your fringe will break and fall apart. 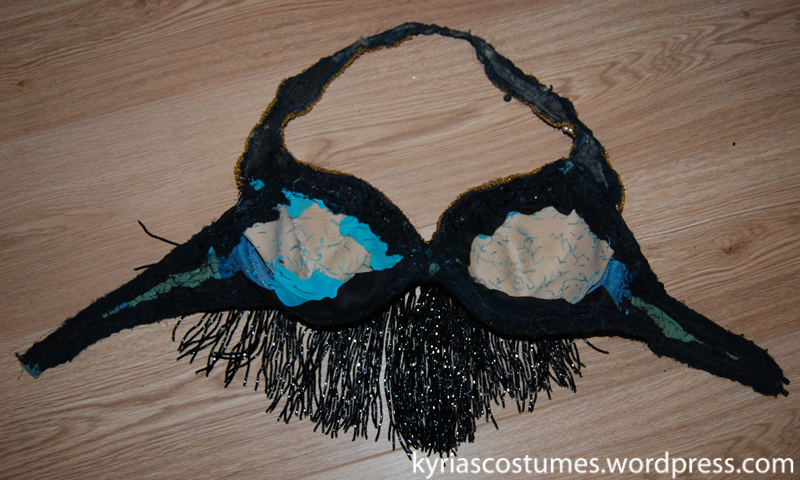 Breaded fringe is one of the most effective material to use in a bellydance costume and also the one that causes the most trouble when it breaks down. Stepping into tiny beads during a performance is painful and covering the stage with beads coming from your fringe can cause harm to other performers. Wearing a costume will influence how quickly a costume is in need of repair, but choosing materials carefully before starting a project will keep the regular upkeep to a minimum. I like to spend less time on costume upkeep and more time on dancing :-). When beaded fringe gets damaged, it looses fringe creating a bit of a jagged and sparse look. The little bit of wiggle room created by jagged edges on beads is allowing the beads to move around on the thread during movement, causing even more wear. Jagged edges also act like a mini knife (if you ever cut yourself on broken glass, you know what I am talking about) and slowely saw through the threads holding the fringe together. In the example below, you can see an example of what damaged fringe looks like. The fringe in this image happens to be twenty year old high quality Egyptian fringe. Given the age and the amount of use and abuse, I’d say this fringe is holding up great. 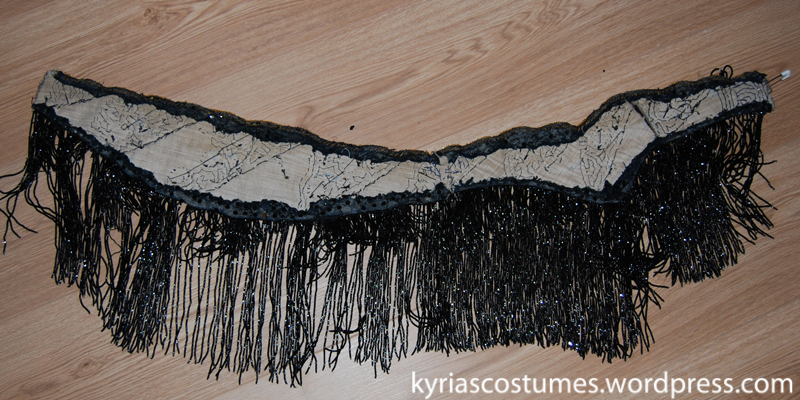 In fact, most of the fringe is in such a good state that I can reuse it into a new costume I am making. One of the best time saving materials for costumers is (pre) beaded fringe. Beaded fringe is hand made and thus on the expensive side. If you compare the amount of beads that go into making the fringe and the amount of labor to make your own, beaded fringe is a steal. Not having to slave away hours and hours on beading your own is a big plus in my book! The fringe is sewn to a heavy cord, allowing you to cut and sew the fringe on your costume as you see fit. The most common type of beaded fringe is straight fringe, in 4″ / 10 cm and 8 / 20cm length. Beaded fringe is usually knotted to a cord of approximately “1 yard/ 1 meter. For a belt, I use approximately one piece and a bit for a size 12 /EU size 42 hips. Beaded fringe is also available though less common as beaded swags, or in ‘triangle sets’. These triangle sets consist of two pieces for the belt and one for the bra, beaded small at the ends and long in the center, thus creating a triangle shape. More rare but also available is pre beaded swagged fringe. Falling down in loops, these swags can be sewn to any costume in no time. The fringe is made of seed beads, which is a term used for all types and shapes of smaller sized beads. 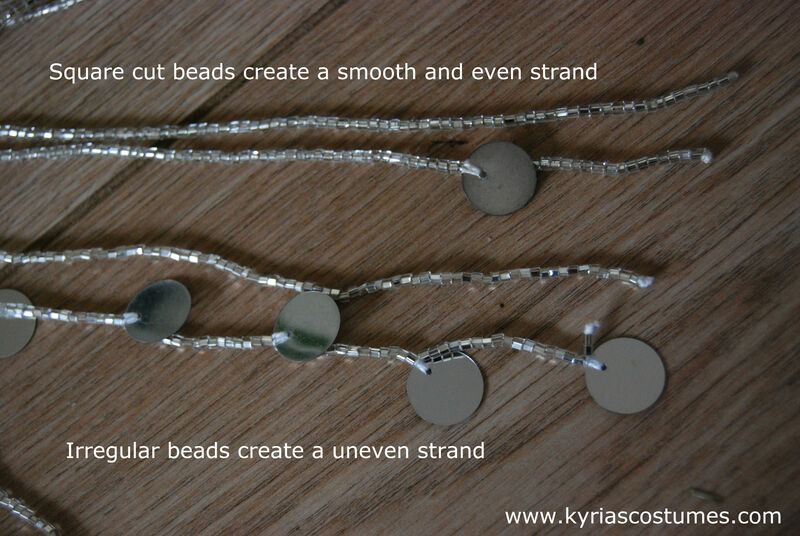 The beads can be rounded or tubular shaped. The beads used for Egyptian pre beaded fringe are usually glass beads lined with a reflective layer to increase the shiny effect of the fringe. 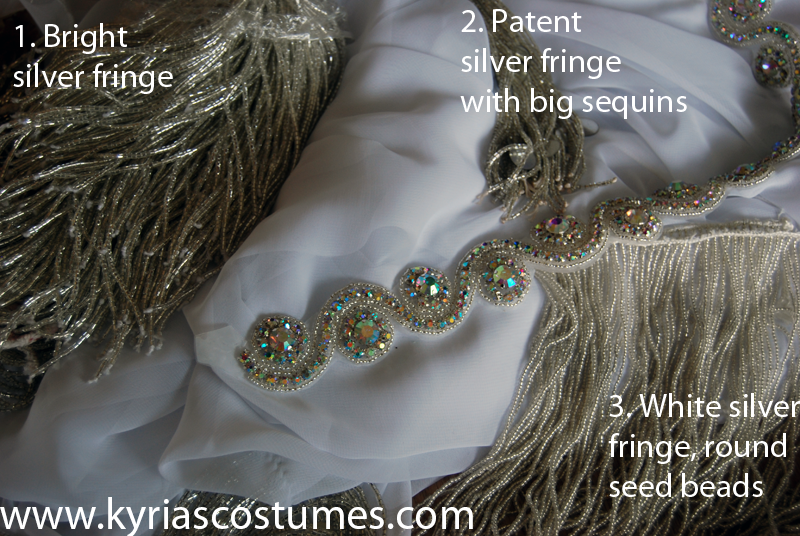 What fringe is best suited for a bellydance costume? Different types of beaded fringe are available online. Personally, I stay away from the decorative beaded fringe that is sold in sewing shops. This type is meant to be decorative and won’t stand up to heavy use. I also stay away from plastic beaded fringe. Plastic beaded fringe is cheap and the luster will soon disappear from the beads. It is ofcourse totally up to you what type of beaded fringe you’d like to use in your costume and these types can certainly create stunning effects. I prefer using Egyptian pre beaded fringe, as the quality is superb. Handpicking beaded fringe in Mahmoud’s store in Cairo is one of my favorite parts of a trip to Egypt. Since I can’t afford to go to Egypt twice a year, I resort to buying fringe from online stores and eBay. The subject of buying beaded fringe online deserves a post all by itself, so I’ll post more about it later. – Beads. Check if the beads are straight cut on the edges. Sharp edged beads will slowly saw through the thread, causing the fringe to break. 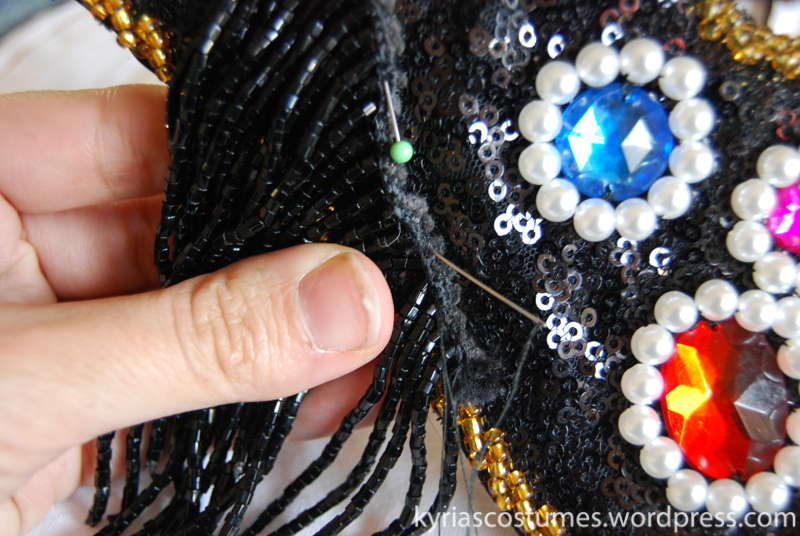 The beads should have straight edges, and there should be little to no broken beads in the fringe. – Thread. The thread is heavy cotton thread, securely knotted on the bottom and the top. Do not trust fringe made with regular sewing thread and don’t make your own fringe with regular sewing thread. – Knots. The knots are important, as they keep the fringe tied to the cord on one side, and it ties of the fringe on the other side. The knots should be tied, double knots. To make the fringe longer lasting, use cear nail polish to seal the knots by dabbing a bit on each and every one. – Material. There is a use for every type of fringe, but glass fringe works best for the low light environment . The durability of glass is also much longer, which is why I prefer using fringe made from glass beads instead of plastic. – Amount of fringes per inch / cm. Good quality beaded fringe has fringes that are set closely together, thus creating a curtain of fringe. An easy way to reduce the labor on beaded fringe is by creating bigger gaps between the individual fringes. This changes the look and feel of the costume completely: sparse fringe makes a costume look unfinished unless it is a well thought out design element. Warning: this post contains images of extreme amounts of rhinestones and may cause temporary blindness due to all the glitter. 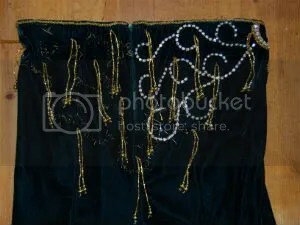 In part 4 you could see the progress on the front of the skirt, replacing the old beading with new beading. I’m not extremely pleased with the beading on the front, as I think the middle curl is too small. It would look better if it was bigger, but then again I vowed to myself to finish as many projects as I can in 2011. On January 1th 2012 everything that is left from my fabric stash, sequins, rhinestones, etc, will be given away to people who will make good use of them. My standards of what a finished costume should be have been lowered so I can get away with making more costumes this year. I added gold cluster fringe too but didn’t take a picture. 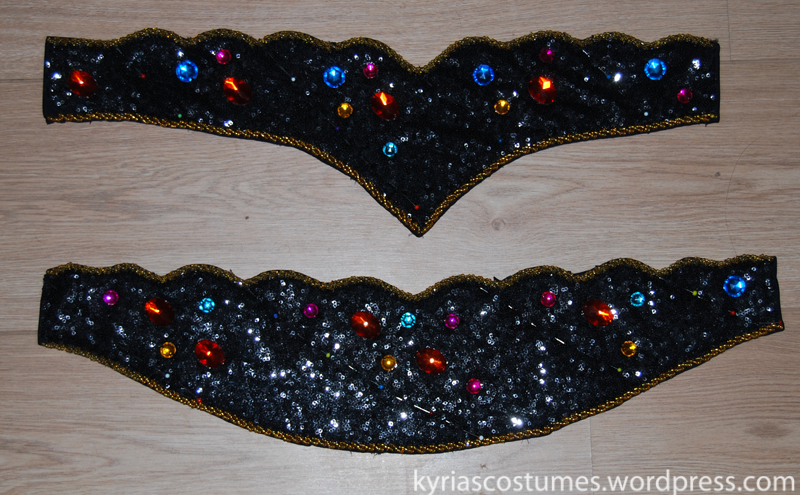 I removed the gold sequins and laid out a new pattern with rhinestone chain. I left yellow threads in the fabric because I used it as a general guide to where I wanted to place the curls. 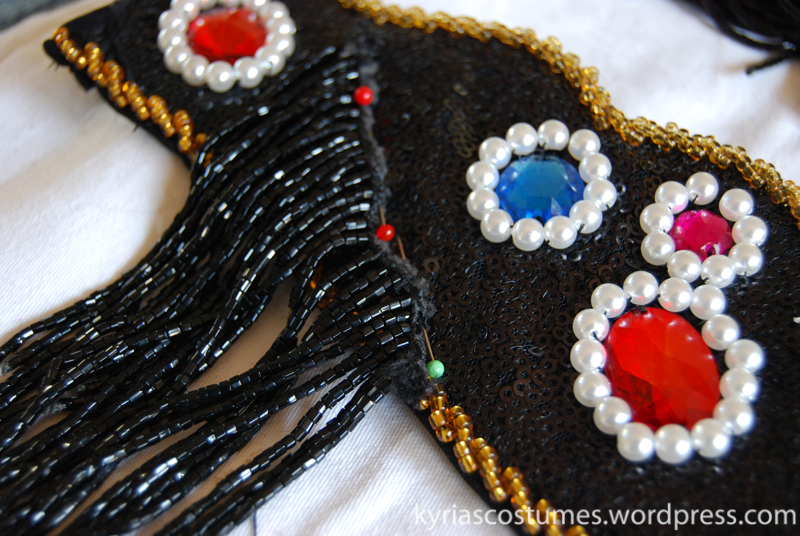 The only thing left to do is making gloves/armbands and a headband, edged with gold seed beads. 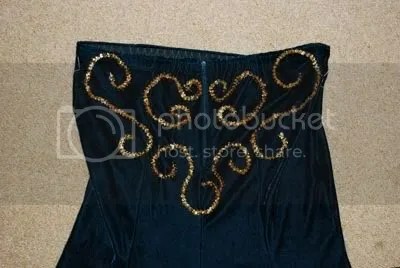 I also wanted to add a waist strap to the skirt, starting at the indentation in the waistband on the left hip, traveling around the waist and back to the waistband. For now I’m going to let the costume rest, as I have a student recital next weekend and my students might need to borrow skirts from me. 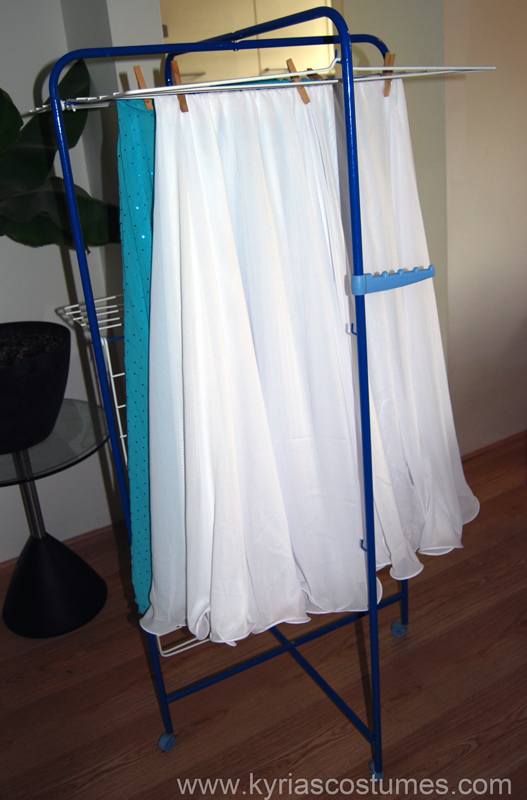 I have two huge pieces of chiffon like fabric that I want to turn into skirts. To be specific, I’ve had those two chunks of fabric for over three years now, with the intention of making skirts. It’s a good thing I’m making an extra effort to use the stuff in my stash this year!